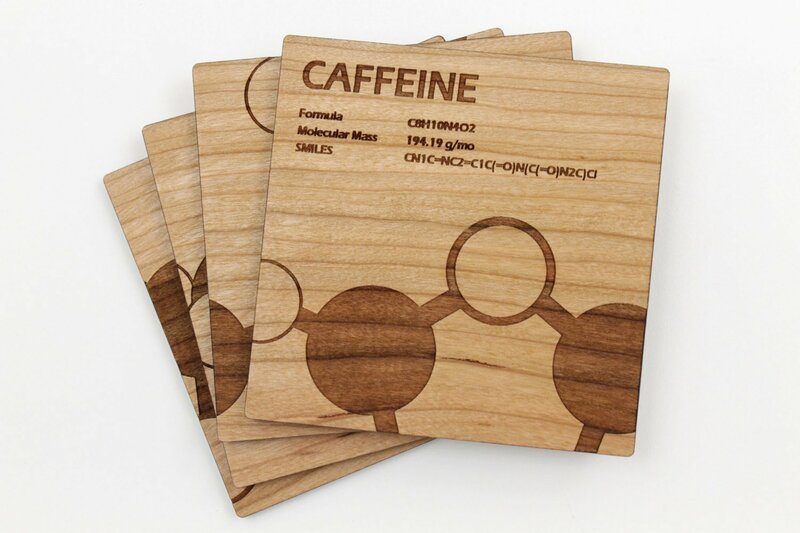 These sustainably harvested cherry wood "Alcohol Molecule" coasters are a scientific set of 4. They are laser etched and finished with natural looking clear satin lacquer to enhance and protect the wood's natural beauty. Complete with chemical properties of alcohol engraved in the coasters.A great gift idea for the science or chemistry fanatic in your life.Our wood products are made using only what the forest gives us. We carefully and selectively harvest only fully matured trees to encourage and enhance the natural prosperity of our forest. Our wood is all milled on site and dried in solar kilns using the power of the sun.The coasters measure about 3.5" square x 0.2" thick.